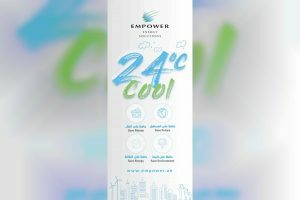 Emirates Central Cooling Systems Corporation, Empower, the world’s largest district cooling services provider, continues its summer campaign, “24⁰C Cool,” which was launched in July 2018. The three-month campaign seeks to reduce energy consumption by maintaining optimum temperature and reducing the value of customers’ consumption bills, to achieve sustainable development goals. Empower achieved 5.6 percent savings on district cooling consumption during the first month of the campaign. It includes tips and guidelines that contribute to reducing energy use during the summer. These include encouraging consumers to set their air conditioners to 24 degrees Celsius, in addition to other innovative methods to lower room temperature and cut down on monthly costs by using environmentally friendly tools. Prior to the summer season, Empower ran a pre-summer preparation campaign of “8 Steps Summer” to ensure accuracy, efficiency and reliability of the usage of district cooling during the peak season. The pre-summer campaign offered residents simple, yet effective tips to prepare their room to face the summer months. It also offered methods to reduce heat build-up in homes and lower monthly expenses in an eco-friendly way. “We are extremely pleased with the successful results of our summer campaign in the first month. This reflects customer awareness and confidence in Empower due to our innovation in the use of sustainable and responsible methods in our operations. This helps in achieving the vision of our leadership to enhance sustainable development and green economy, which is consistent with the Dubai Clean Energy Strategy 2050, launched by His Highness Sheikh Mohammed bin Rashid Al Maktoum, Vice President, Prime Minister and Ruler of Dubai, to transform the emirate into a global hub for clean energy and green economy,” said Ahmad Bin Shafar, CEO of Empower. He further confirmed that Empower is committed to protecting the environment by achieving sustainable development goals and offering efficient district cooling services, according to the best and highest global standards. This contributes to reducing consumption and saving district cooling services. Empower introduced an online calculator on its website to helps its customers monitor and plan their district cooling consumption, helping them reduce consumption and achieve significant savings.